This temple is situated in the bank of Shambhavi River at Bappanadu village of Mulki town. It is 29 K.M. north to Mangalore following National Highway No.17. The main deity of this temple is Goddess Shree Durgaparameshwari. The place Bappanadu means Bappa's village. As per the legend Bappa a Muslim merchant is responsble for temple construction. Annual festival (Brahma Rathotsava) of the temple falls in the month of April. 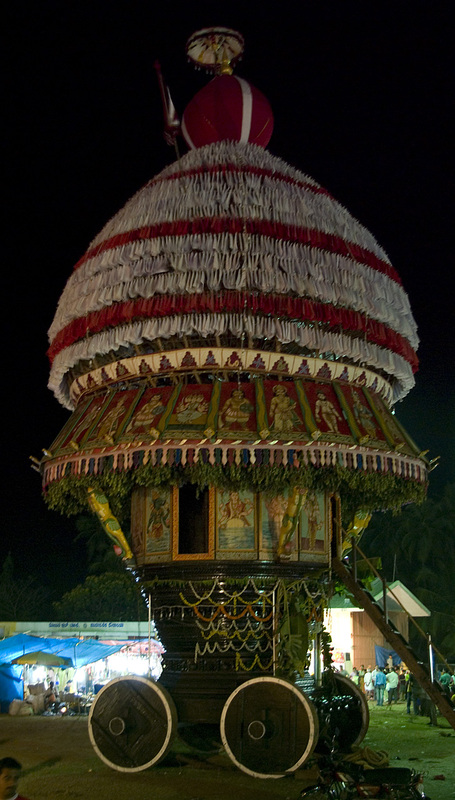 Bappanadu Dolu (musical drum) is well known and There is a large drum that is kept in the side of the temple. Once there was a demon called Darigasura ruling Shonitapura. He had enmity with Devatas and Lord Vishnu. In antagonism and with the intention of defeating the Devatas and Lord Vishnu he worshiped Lord Brahma and got a boon. With a help of this boon he defeated Devatas and Lord Vishnu and snatched the ammunitions from Lord Vishnu and handed over that to his wife and told to keep that in worship place. While Lord Vishnu was mourning for his lost ammunitions Goddess Durgaparameshwari appeared before him in the form of seven angel-women (Sapta-Durgas) and promised to kill a demon. These Sapta-Durgas went to Shonitapura accompanied by one Deity called Guliga. Bhagavathi one of the Sapta-Durgas appeared before demon Darigasura while he was on the way to take a bath in the River, in disguised form of an old woman and begged for a meal. Darigasura advised her to go to palace and ask a meal with his wife. And also told her to tell him that if she didn't get a meal. Accordingly Goddess Bhagavathi visited the palace of Darigasura and met his wife but asked for ammunitions of Lord Vishnu to be returned. While wife of Darigasura opposed to return, Bhagavathi willingly and wrongly informed Darigasura that his wife is not ready to give her a meal. Hearing that Darigasura ordered his wife to give Bhagavathi what she wished. Darigasura's wife gave the ammunitions of Lord Vishnu to Bhagavathi accordingly. Knowing deceived by Goddess Bhagavathi, demon Darigasura became furious and declared war against Sapta-Durgas and attacked them in ambush. He defeated Deity Guliga in war. But after seven days of furious war demon Darigasura was defeated by Sapta-Durgas and ultimately he ran away and took hide in underworld. Goddess Bhagavathi taken form of Bhadra-Kali and began for his search. While demon Darigasura came for offering pooja to Lord Shiva in late evening, Bhadra-Kali found him and slewed him. Bhagavathi then accompanied by her other sister goddesses and Deity Guliga, visited Lord Vishnu and asked for a boat made by sandal wood for a journey from Vaikunta (Great heaven) to Bhooloka (earth) with a intention of settling down in Bhooloka for betterment of earthly people. Lord Vishnu permitted them to take a Sandal wood tree from Vaikunta for preparing a boat. Accordingly they made a boat and started their journey. Boat came to Bhooloka and crossed Kasaragod, Kumble, Uppala, Pattattur, Manjeshwara, Udyavara, Ullala and Kudroli of southern coast of India. From there it came to Sasihithlu near Mulki town. There, Bhagavathi took tender coconut from one lower caste devotee and wished to settle there only. Goddess Durgaparameshwari emerged symbolically in conjunction point of Shambhavi & Nandini River at Mulki border. In due course, one Muslim merchant viz. Bappa Beary while traveling through Shambhavi River for trading in remote places, his boat suddenly stopped in the middle of the river. While examining the cause he found blood spread over the river water and he deeply felt fear on that. Mean time a divine voice came from the ether ordering him construct a temple with the help of Mulki Sawantha (king) and to make pooja by the help of Baila Udupa (priest). Mulki Sawantha was belonging to Jain religion and a decent ruler. Hearing the incident from Bappa Beary, the king built one temple with the contribution of many other donors and made Baila Udupa as a chief priest of the temple. Hence the temple became Bappanadu Kshetra. 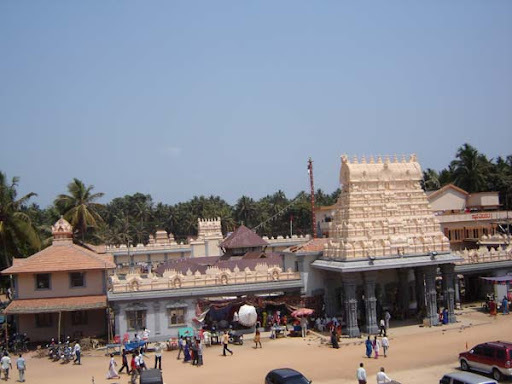 Bappanadu Sri Durgaparameshwari temple is one of the main Shakti worship Centre of the South Kanara district of Karnataka. Here main deity is in the form of Linga (symbolic statue). Eligibility of Muslims for accepting prasadas (blessings) of the temple is one of the special features of the Kshetra. Muslims also participate in the temple festivals. Even today the prasadas of the very first day of the festival is given to the house of Bappa Beary. But in spite of all these legendary and mythological views and following of the traditional cultural activities based on these views, the proper historical documents depicting the period of the temple is very rarely available. While observing the temple we can find the feature of 14th century architectural style in device of main sanctum, pedestal etc. In 1333-35 A.D one African traveler viz. Iban Batoota visited India wrote that some of the Muslims in the region (Mangalore and Mallika town) were following Hindu traditions. But the region he mentioned is cannot be confirmed with the Mulki, as there is a vast difference in geographical features. As believed by the local people Bappa a Muslim merchant has taken important role in the construction of the temple. But confirming the role of the Bappa Beary in construction of the temple is not available. Whether Bappa was a Muslim or he is a Bapa Pai (a Saraswath Brahmin) or he is a follower of Jainism is still a point to ponder. The name Bappa also comes in one copperplate inscription (1607 AD) available in Kotageri Jain Basadi in which it is said " Moose Kavi son-in-laws offered Varaha 113 on this Kunhappagu to Bappa ". However, we can assume that Muslims have a major part in this temple activity as it is mentioned in one recently got inscription of Hanjaman (Association of Muslim merchants). Also there are two inscriptions at either side of the temple. Though one is completely damaged, another inscription is pertaining to the era of 1411 AD and is belonging to Tedi. While verifying the words mentioned in this inscription we could strongly believe that in the history of temple many Non-Brahmins also participated in the activity of the temple. Beating of the drums during annual festival of the temple is an important factor of celebration. Bappanadu Dolu is well known for it's beating all over Karnataka. We can't compare the number of drums with temples elsewhere in Karnataka. Beating of the drums while local rulers and landlords visiting the temple during festival was an age-old tradition. During annual festival time a certain community empowered to participate in beating of drums perform this service to the deity with great enthusiasm and devotion. Temple authority would pay a certain amount of honorarium to these drum beaters. A beautiful view of this drum beating performed by beaters accompanied by their family members and community is really eye catching one. As a symbol of the specialty of drums, temple authority made one big size drum and hanged it beside the main entrance. From Mangalore City there are plenty of service busses available to Mulki and Udupi. Since the temple is situated near the Udupi Mangalore High way it is very convenient even for new visitors to reach by catching these busses and getting down at Mulki or Bappanadu. From Mangalore to Bappanadu the distance is 29 K.M.